SEALS delivers best practice sustainable technologies to enable cost effective sub-grade strengthening and or capping. Improving sub-grades with PolyCom stabilising aid introduces water resistance, added workability and increased strength delivering a stronger more resilient and environmentally friendly platform for your project. Strengthened sub-grades deliver huge cost advantages by allowing more economic pavement designs and drainage options. Sub-grade capping eliminates or greatly reduces re-work from weather or traffic damage in cut to fill operations, again reducing project costs. 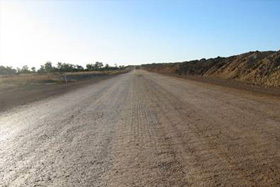 PolyCom stabilisation of pavements is approximately one third the cost of standard methods, delivers comparative results with regard to strength but also imparts a very high degree of water resistance and all important flexibility. There are no cure time constraints and the pavement is re-workable at anytime. 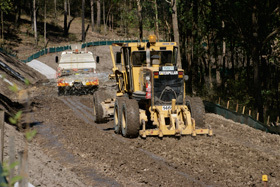 All ground improvement activities involving PolyCom stabilising aid can be effected utilising standard construction plant or stabilising machines. 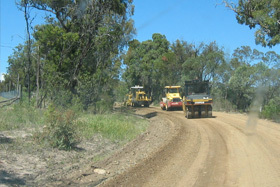 Wear courses on council roads, rural tracks as well as access roads all benefit by improvement with PolyCom. 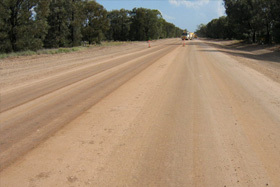 The product can be incorporated into the pavement during a standard service where remixing and re-shaping is performed. A PolyCom improved pavement will deliver extended service interval requirements by way of increased strength, a highly resilient surface and water resistance. Mining roads can be improved considerably. Improvements to running course strength and wear-ability as well as reductions in rolling resistance are easily achieved and just as easily maintained with small changes to operational procedures. These improved water resistant roads will deliver substantial net haul fleet savings to the operator. Tighter and more durable water resistant road surfaces produce much less fugitive dust and sediment run off to our water ways. 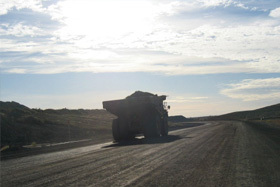 These improved surfaces are environmentally valuable and are fast becoming the minimum requirement for all road maintainers involved in construction, energy, mining and local government. Road surfaces like this have a significantly reduced ecological impact, are not difficult to produce and are easily maintained with correct procedures.